The IADC Corporate Counsel College brings legal professionals from global firms together. We’re so excited to sponsor the IADC in their efforts to enhance the knowledge, perspective, and camaraderie of their esteemed membership. Altep Inc., a leader and innovator in eDiscovery, compliance and litigation support, today announced they will sponsor the IADC Corporate Counsel College in Vienna, Austria this October 15-16. The Corporate Counsel College brings together in house-counsel and their law firm counterparts for two days of education and discussion on the latest legal issues affecting global organizations. Modeled after prior, highly successful Corporate Counsel College events which have taken place in the United States, the event will allow attendees to enjoy the beauty and culture of Vienna while sharing their experiences and knowledge of relevant legal issues. Founded in 1920, the IADC has only grown in membership and success over the years, adapting to changing litigation challenges and supporting both individual lawyers and larger organizations such as the defense bar. In addition, the IADC offers advanced continuing legal education opportunities, and provides members with the opportunity to be placed on a number of Substantive Law Committees. As sponsors of the IADC since 2008, Altep has long appreciated the dedication and commitment to excellence that the members of the IADC strive to achieve. With approximately 2,500 members across the globe who specialize in a multitude of practice areas, the IADC helps members keep up with evolving litigation standards from a global perspective, and provides a platform for members to discuss, share, and stay informed. The IADC also hosts annual and regional meetings, as well as webinars and other educational events throughout the year. For more information, visit http://www.iadclaw.org. Altep, Inc. is a Relativity Best in Service – Orange Level hosting provider, with certified Administrators, Analytics Specialists, Reviewers, Infrastructure Specialists, and Sales Pros on staff. The firm assists Fortune 100 and AM Law 100 clients with digital forensics, discovery management, and compliance risk assessment. E-Discovery services include early data assessment, ESI and traditional paper processing, and secure hosting. 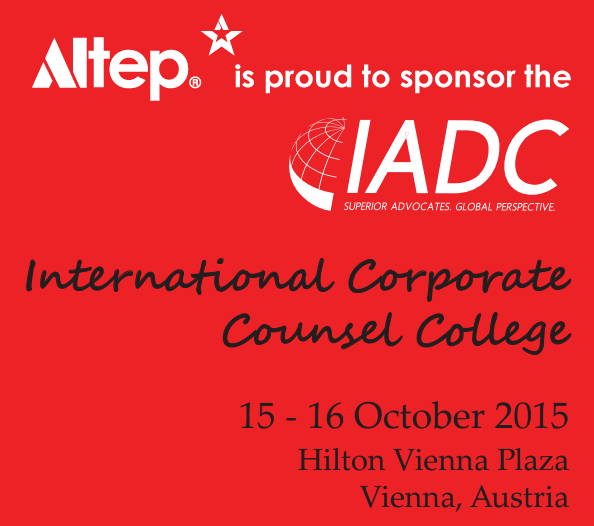 Altep is proud to sponsor The IADC International Corporate Counsel College.